We’ve reached the end of summer and are into Back To School season. This means that it’s time to announce the winners of the Goodie Two Sleeves $400 Giveaway. For those who don’t know about Goodie Two Sleeves, they launched in 2002 when two teenage friends decided to start selling t-shirts from the back of their car. They set out to make hilariously awesome t-shirts without getting crude. They now deliver t-shirts all over the world and are even #1 in Antartica. 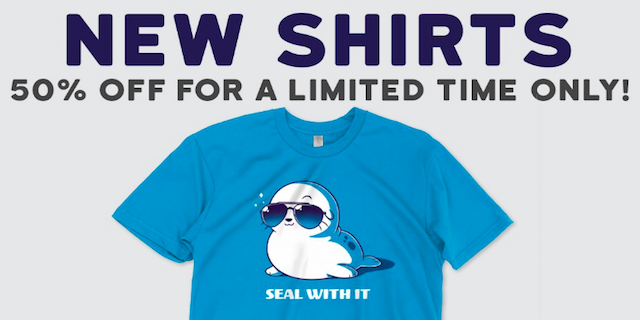 If you love clean, funny, soft, t-shirty goodness, you’ll love Goodie Two Sleeves! 1st Prize ($250 value): Monica McCarthy of Phoenix, AZ. 2nd Prize ($85 value): Brianne Armstrong of San Antonio, TX. 3rd Prize ($60 value): Cheryl Ross of Hendersonville, NC. Congratulations! We’ll be contacting you shortly.